Lyrics Of Sahi Bola Re From Movie - Muskurake Dekh Zara (2010): Nice playful song sung by K. K and music composed by Ranjit Barot. The video of this song is available on youtube at the official channel T-Series. This video is of 4 minutes 34 seconds duration. 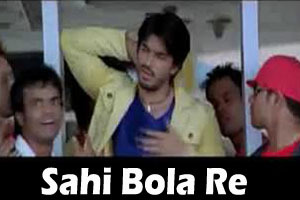 Lyrics of "Sahi Bola Re"
Lyrics in Hindi (Unicode) of "सही बोला रे"